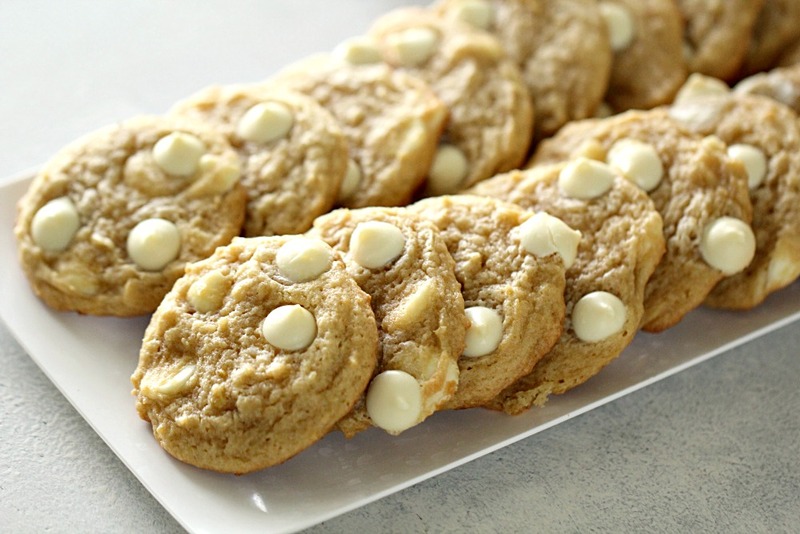 These Banana Cream Pudding Cookies are THE BEST. Loaded with banana flavor from a pudding mix and a mashed banana, they turn out soft and chewy every time. My husband’s favorite dessert is Banana Cream Pie. I wanted to make him his favorite treat, but didn’t have all the ingredients to put together a pie. 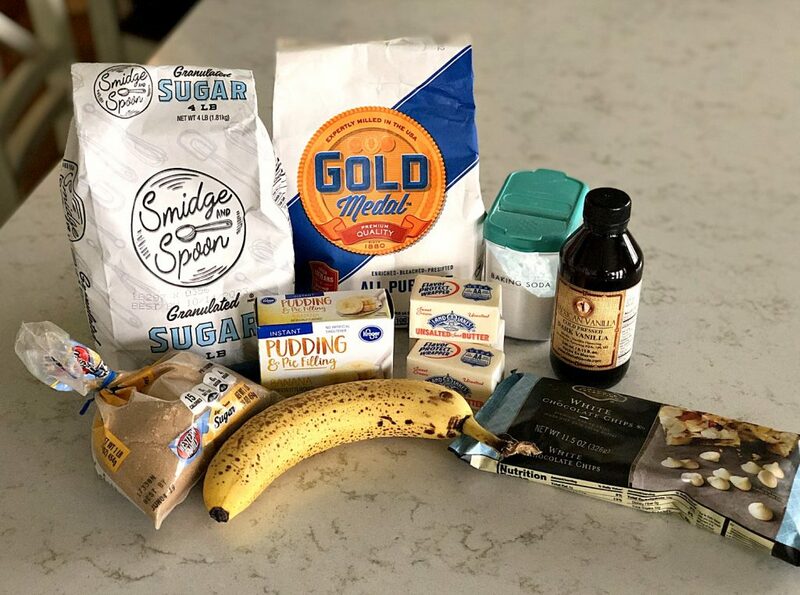 These Banana Cream Pudding Cookies have all the flavor of a Banana Cream Pie without all the work – they are so easy to make and are failproof! The secret ingredient is a package of banana instant pudding. They are soft and chewy because of the pudding mix and full of banana flavor. I also added a mashed banana to really take that banana flavor over the top! 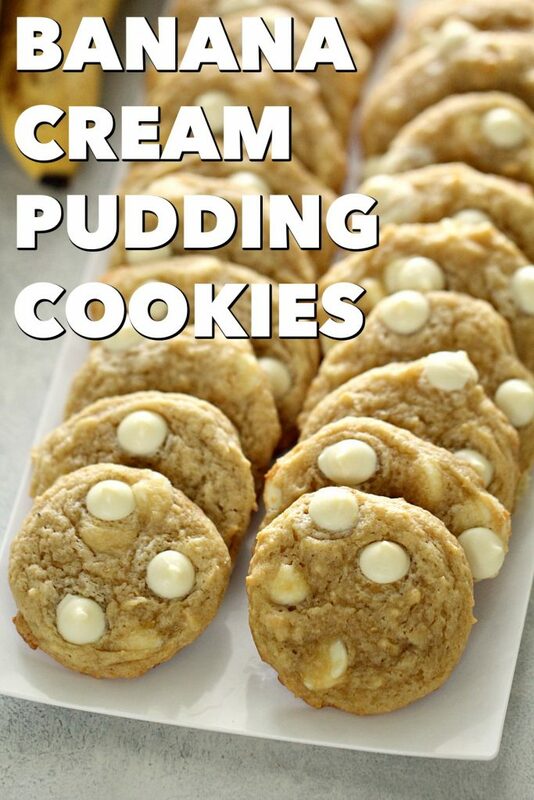 We love using pudding mixes in our cookies – be sure to check out our Lemon Cheesecake Pudding Cookies and our Chocolate Chip Pudding Cookies. The pudding mix is added to the recipe unprepared, in its powdered form. This really is the secret ingredient for a soft cookie that will still hold its shape. I love using a Kitchen Aid to mix this dough together. It creams the sugars and butter and pudding mix together perfectly! I used a medium sized cookie scoop for these cookies. I like that they are the perfect shape and all the same size when you use a scoop. I also use a silicone baking liner to help to cook evenly and get crisp on the bottom but stay soft on the inside! The pudding makes them a little sweeter, so I would suggest using dark chocolate chips instead of milk! Looking for more banana recipes? Try these! In a large bowl, cream together butter, granulated sugar, brown sugar and pudding mix. Add in mashed banana, eggs and vanilla. In a separate bowl, combine flour and baking soda. Add into creamed sugar mixture. 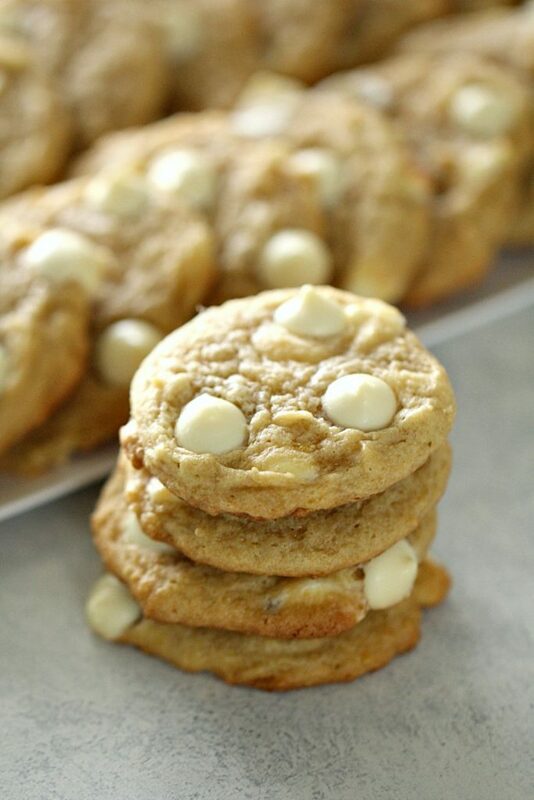 Gently fold in white chocolate chips. 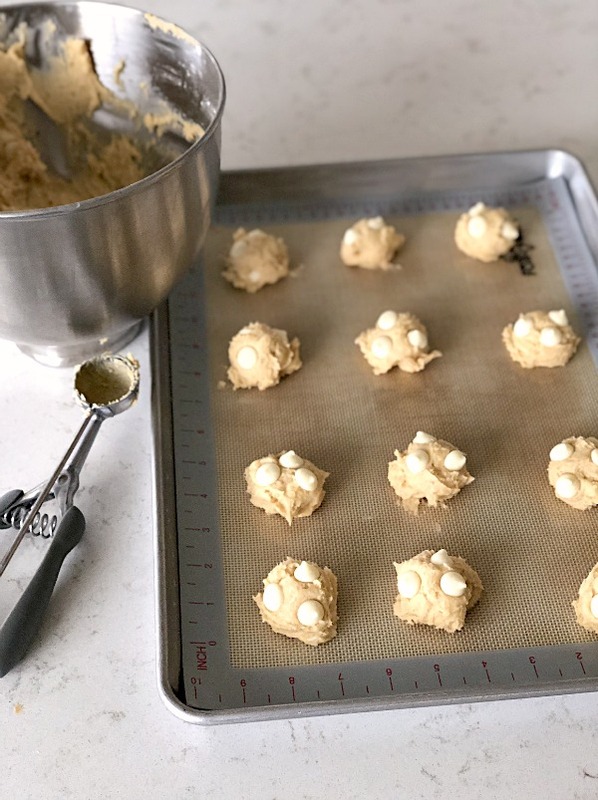 Roll into 1" balls (or use a cookie scoop) and place on a baking sheet sprayed with nonstick cooking spray or covered in a silicone baking liner. Bake for 8-10 minutes or until golden brown (be sure not to overcook - they will continue to set up even after being removed from the oven). 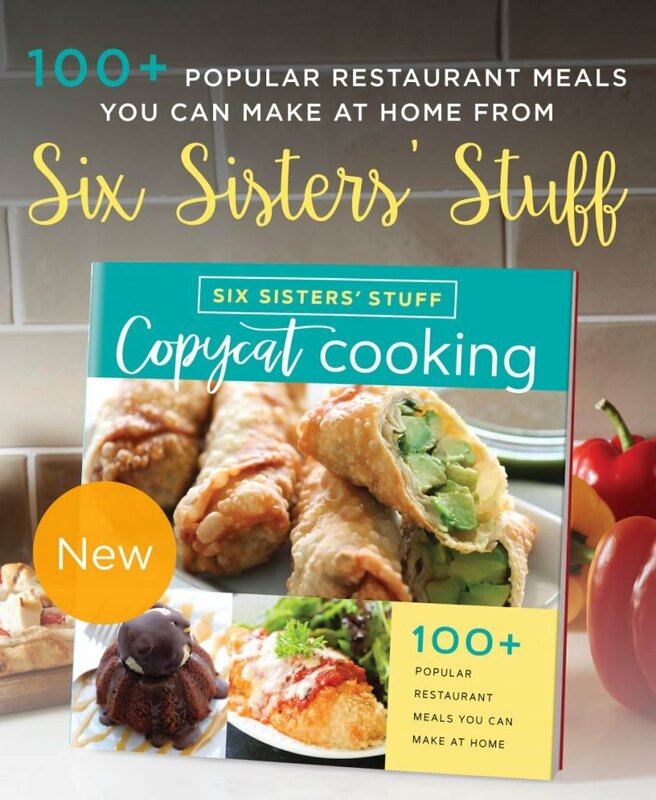 Looking for more cookies and other desserts? Well you are in luck. Check out our Youtube Channel. 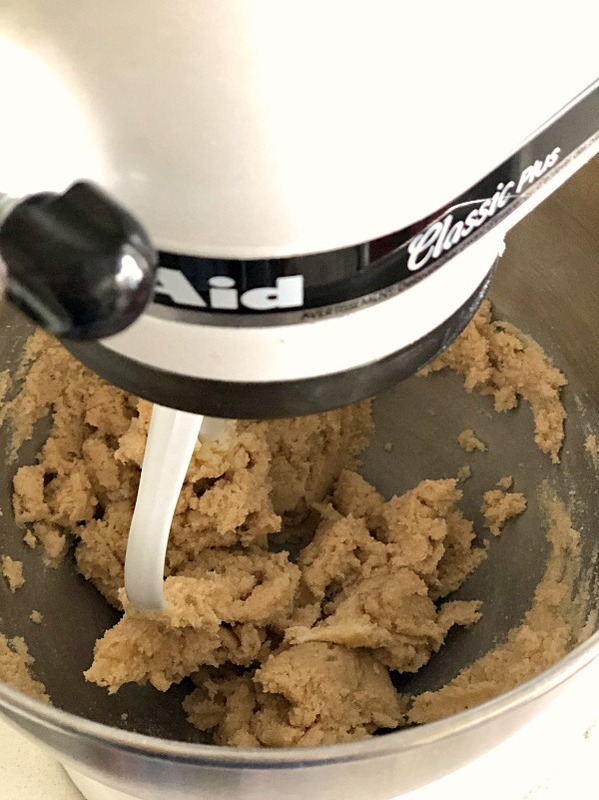 Today we are sharing how to make 4 of our FAVORITE cookies!